Background & Objective: The incidence of non-small cell lung cancer (NSCLC) has been rising over the past several decades. Despite various therapeutic regimens and modern diagnostic techniques are developed, NSCLC still have an extremely poor prognosis due to drug resistance. Therefore, it is critical to find a novel precise diagnosis and effective treatment approach for NSCLC patients. MicroRNAs (MiRNAs) are a class of 18-25nt non-coding small RNAs, which have been shown to be involved profoundly in the pathogenesis such as cellular proliferation, differentiation, development, apoptosis and tumorigenesis in many human tumors including of NSCLC. We reviewed existing research literature regarding correlations between miRNAs and their target's response to anticancer treatment, and summarized the recent findings between miRNAs and therapy availability in NSCLC. Lung cancer is one of the most common malignant tumors and has become the primary form of cancer-related death in the world. As one category of lung cancer, NSCLC concludes lung adenocarcinoma, lung squamous carcinoma and large cell lung cancer [1, 2]. Although various therapies have been applied to clinical practice, patients still have poor five-year survival rates because of advanced period and resistance to therapies, which places a large health burden on society . With both traditional radiochemical and novel targeted therapies, most initially sensitive patients will eventually develop a “secondary resistance” to these therapies. MiRNAs are a class of 18-25nt non-coding small RNAs without open reading frames (ORFs) in living species, which have been confirmed to be involved in multiple biological processes, such as carcinogenesis, angiogenesis, cell proliferation, invasion, migration, differentiation and apoptosis, and play crucial roles in the regulation of tumor development and progression [4, 5]. It is discovered that every mature miRNA originate from long primary microRNA (pri-miRNA) transcript or precursor microRNA (pre-miRNA) molecules, which are then sheared by biological enzymes Drosha and Dicer, and finally integrate to RNA induced silencing complex (RISC). Current studies show that if this miRISC is binding with targeted mRNA 3' UTR, the targeted mRNAs translation might be inhibited in some degree . These features have been regarded as a novel idea in the future therapy of malignant tumors. However, the distribution of miRNAs might indicate functional specificity in vivo and vitro. Interestingly, many miRNAs are overexpressed in NSCLC tissues, but have low expression in the adjacent normal tissues, called proto-oncogenes. Additionally, several miRNAs are found to be under-expressed in the NSCLC tissues, which are considered as “anti-oncogenes” [6, 7, 8]. Furthermore, miRNAs which target multiple genes and different groups of target genes of the same miRNA are often regulated mutually. Therefore, some genes can also be co-targeted by different miRNAs, which form a dedicated regulatory net (Figure 1) . Based on the research mentioned above, miRNAs might serve as novel and promising potential biomarkers for diagnosis, prognosis and therapy of patients with NSCLC. MicroRNAs and their targets involve in the drug-response in NSCLC. New targeted cancer therapies will increasingly replace radio-chemotherapy because of considering many physical, chemical and biological damages caused by radioactive rays . Compared with traditional radio-chemotherapy, novel targeted therapies feature more specificity and efficiency in the cancer therapy. Binding to ATP-binding sites of epidermal growth factor receptor-tyrosine kinase (EGFR-TK) domain and its downstream signal pathways, such as epidermal growth factor receptor/phosphoinositide-3 kinase/protein kinase-B/mammalian target of rapamycin (EGFR/PI3K/Akt/mTOR), rat sarcoma/ extracellular regulated protein kinases/MYC (RAS/ERK/MYC) can be inhibited . Thus, only patients with EGFR activation mutations can benefit from this mechanism. Therefore, EGFR-TKIs are regarded as an important breakthrough in the targeted therapies in NSCLC . Current studies indicate that many miRNAs are widely involved in EGFR-TKIs therapies and the expressions of miRNAs are different between the resistant and sensitive tumor cells under the EGFR-TKIs therapy . For example, miRNA-200c targets Zinc finger E-box binding homeobox1 (ZEB1) protein or inhibits PI3K/Akt signaling pathway to enhance gefitinib sensitivity . MiRNA-126 induces autophagy by suppressing insulin receptor substrate-1 (IRS-1) and PI3K/AKT signaling pathway in many tumors including colon cancer, NSCLC and malignant mesothelioma . Likewise, miRNA-143, miRNA-134, miRNA-218-5p can directly bind 3'UTR of EGFR and suppress migration and proliferation of tumor cells [14, 15, 16]. It is believed that miRNA-223, miRNA-99a and miRNA-548I target insulin-like growth factors 1 receptor/phosphoinositide-3 kinase/protein kinase-B/mammalian target of rapamycin (IGF1R/PI3K/Akt/mTOR) signaling pathway and can inhibit proliferation, migration, and invasion of tumor cell lines. [17, 18, 19]. The interaction of phosphoinositide 3-kinase-seven in absentia homolog 2 (PI3K-SIAH2) regulated by miRNA-30-5p family including miRNA-30a-5p, miRNA-30b-5p, miRNA-30c-5p, miRNA-30d-5p, and miRNA-30e-5p, can be considered as a potential treatment target and theranostic panel in NSCLC, particularly adenocarcinoma . All above these anti-oncogenic miRNAs have the potential to enhance tumor sensitivity toward targeted therapies. MiRNAs contribute extensively to platinum-based chemotherapy in NSCLC. For example, by targeting polycystic kidney disease-2 (PKD2), miRNA-106b-5p increases chemosensitivity in NSCLC . By binding to the high mobility group A 2(HMGA2)-mediated E2F1-Akt pathway, miRNA-26a retards cell growth and sensitizes cell response to cisplatin (CDDP) . 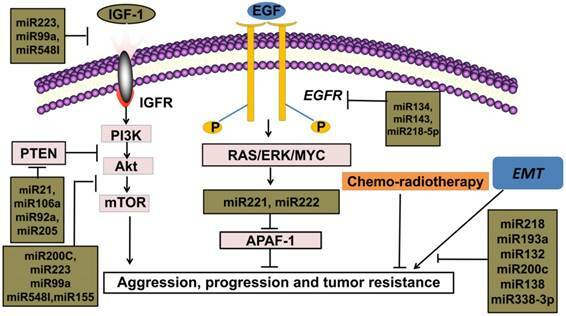 The miRNA 17 family can suppress TGFβR2, a central receptor of the tumor growth factor-β (TGFβ) signal pathway, and reverse cisplatin-resistance in NSCLC . It is observed that frizzled class receptor1 (FZD1), involve in tumor proliferation and chemoresistance, and is also a target gene of miRNA-135b . In the therapies of cis-diaminedichloroplatinum (CDDP), miRNA-379 functions as a therapeutic enhancer by binding to eukaryotic initiation factor 4G2 (EIF4G2) in NSCLC . According to emerging data, miRNA-296-3p attenuates cell proliferation and increases cell sensitivity to 5-FU, DDP and paclitaxel by targeting C-X3-C motif chemokine receptor1 (CX3CR1) in NSCLC . Also, knockdown of cyclin J (CCNJ) can increase the sensitivity of DDP-based chemotherapy and the effect can be achieved by miRNA-146a . Moreover, miRNA-9600, a novel molecule, is identified to impair the expression of signal transducer and activator of transcription 3 (STAT3) and thus inhibits cell growth and enhances paclitaxel sensitivity in NSCLC . Furthermore, up-regulation of miRNA-589 and miRNA-1244 inhibit viability of tumor cells and reverse resistance to cisplatin in NSCLC . Phosphatidylethanolamine-binding protein 4 (PEBP4) is a crucial tumor promoter in NSCLC cell lines, which is downregulated by miRNA-34a . Interestingly, miRNA-181b inhibits chemoresistance and promotes chemosensitivity by binding TGFβR1/Smad signal pathway . Over-expression of miRNA-7 sensitizes NSCLC cells to paclitaxel and promotes cell apoptosis . Similar to surgery, radiations are deemed to minimize and shrink the volume of tumors in terms of local control, an irreplaceable therapeutic choice for patients with NSCLC . Likewise, some miRNAs are closely involved in the radiotherapy process. MiRNA-29c enhances radiosensitivity in NSCLC by targeting BCL2 and MCL1, both of which are anti-apoptotic genes . Also, miRNA-200c enhances radiosensitivity in NSCLC by retarding oxidative response genes and hampering DNA repair . Experimental results establish that miRNA-328-3p increases radiosensitivity by inducing DNA double strand breaks (DSBs) . In addition, miRNA-138 promotes radiosensitivity and leads to apoptosis by targeting Sentrin/SUMO-specific protease 1 (SENP1), which is a marker of radioresistance in NSCLC . Overexpression of miRNA-449a accelerates apoptosis in NSCLC tissue under radiotherapy . Used as a tumor suppressor in patients with NSCLC, miRNA-451 can reverse both chemotherapy and radiotherapy resistance by targeting c-Myc . MiRNA-184 inhibits NSCLC cells survival and invasion capability by binding c-Myc and Bcl-2, also promote cisplatin response in NSCLC cells . CDKN1A (cyclin-dependent kinase inhibitor 1A) can arrest cells at G1 phase and RAD21 (Rad21 homolog (S. pombe)) and repair DNA damage caused by cisplatin, which are two crucial factors to platinum-based chemotherapy resistance . Inspiring, miRNA-17 family and miRNA-92 family can reverse cisplatin resistance by targeting CDKN1A and RAD21 . Let-7 serves as a tumor suppressor by reducing the expression of oncogenic protein LIN28, and reverse drug-resistance both in radiotherapy and chemotherapy . Multiple studies reveal that the secondary T790 mutation event is related to EGFR-TKIs resistance, which account for about 50% of acquired resistance [43, 44]. These mutations influence the adenosine triphosphate (ATP)-binding region of EGFR, which is the same region where TKIs bind . The activation of downstream signal pathways of EGFR is also related to the loss of its negative regulator-phosphatase and tensin homology deleted on chromosome ten (PTEN) . The concrete mechanisms of drug resistance are still unknown, but it is established that the expression levels of miRNAs are different in NSCLC cell lines compared with adjacent normal tissues. For instance, miRNA-21, one of the most familiar miRNA, is in 3'UTR of the vacuole membrane protein 1 gene at chromosome 17q23.1, the easiest amplified region in vivo . MiRNA-21 promotes proliferation of NSCLC by inhibiting the expression of PTEN, a unique tumor suppressor gene in vivo, and induces EGFR-TKIs resistance in NSCLC . In addition, miRNA-106a, miRNA-92a and miRNA-205 can also play the similar effects by binding to PTEN [49, 50, 51]. MiRNA-155 acts as an important oncogenic gene in vivo, which targets the suppressor of cytokine signaling 1 (SOCS1) gene, activates Akt signaling pathway and inhibits tumor suppressors including PTEN [52, 53]. Meanwhile, data from Kitamura et al. suggested that miR-134/487b/655 cluster contributed to the TGF-β1-induced EMT phenomenon and affected the resistance to gefitinib by directly targeting MAGI2, in which suppression subsequently caused loss of PTEN stability in NSCLC cells . Besides targeted therapy strategy, miRNAs are also extensively involved in the various mechanisms of radio-chemotherapy of NSCLC. Hypoxia-inducible factor- 1α (HIF 1α), an upstream signaling molecule of glycolysis, can be activated under hypoxia and upregulated in radiation‑resistant cell lines . MiRNA-21 leads to radioresistance in NSCLC by upregulating HIF1α-induced glycolysis . Besides HIF1, miRNA-210 also repair genomic double-strand breaks (DSBs) induced by radiation, and result in the radioresistance of NSCLC cells . MiRNA-25, a crucial tumor suppressor gene, reduce sensitivity to radiation by binding the B-cell translocation gene 2 (BTG2) in NSCLC . The radioprotector, miRNA-1323, can weaken radiosensitivity by promoting the expression of protein kinase, DNA-activated, catalytic polypeptide (PRKDC) in NSCLC . In addition, miRNAs also regulate the process of chemotherapy besides targeted therapy and radiotherapy. Wnt/β-catenin signaling pathway has been reported to be a crucial mechanism of proliferation, growth, and drug resistance of tumors including NSCLC . Interestingly, miR-181c leads to cisplatin resistance in NSCLC cells by targeting Wnt inhibition factor 1 . Similarly, Li et al. showed that inhibition of miR-196a could reverse cisplatin resistance of A549/DDP cell lines . The role and mechanism of miR-196a might relate with inhibition of drug efflux, down-regulation of drug-resistant protein expression, cell apoptosis, and cell proliferation suppression . MiRNA-21 suppresses drosophila mothers against decapentaplegic protein7 (SMAD7), a key inhibitor of TGFβ receptor signaling and thus reduces carboplatin-response in NSCLC cells . Among targeted therapies, conventional chemotherapy and radiotherapy, anti-oncogenes extensively affect therapy sensitivity. Consequently, upregulation of these genes is closely related to tumor regression and apoptosis in NSCLC. Contrarily, lower expression of these anti-oncogenes might induce invasion and drug resistance of tumor cells. Meanwhile, several tumor-promoting miRNAs have shown an ability to enhance the proliferation and invasion of NSCLC cells. Epithelial-Mesenchymal transition (EMT) is an important step for cancer metastasis. Both epithelial and mesenchymal molecules are crucial factors for cell adhesion, cell polarity and cell shape. While upregulation of E-cadherin is closely linked to lower grade tumor, rising mesenchymal is related to invasive tumor type in vivo or vitro [62, 63]. Recent studies have shown that Snail and ZEB1 are two significant EMT promoters in NSCLC . MiRNA-218 binds to Slug/ZEB2 signaling pathway, one of the EMT-related factors in various solid tumors, and thus improves both anti-cancer ability and therapeutic efficacy in NSCLC . Likewise, miRNA-193a and miRNA-132 can prevent TGF-β1-induced EMT thus improve both anti-cancer ability and therapeutic efficacy in NSCLC [66, 67]. Moreover, miRNA-200c is shown to act as an anti-oncogene by targeting ZEB-induced EMT or PI3K/Akt signaling pathway and overcome gefitinib-resistance in NSCLC [12, 35, 68]. MiRNA-138 can deter chemo-resistance by inhibiting ZEB-induced EMT in patients with NSCLC . Likewise, by binding to ROCK2, an important promoter of EMT, miRNA-101 might gain advanced patients with a longer disease-free survival (DFS) . MiRNA-338-3p can inhibit the growth, migration and invasion of NSCLC by controlling Sox4-induced EMT . Upregulations of these miRNAs can enhance therapy-sensitivity and thus benefit patients. EMT acts as an important element for tumor proliferation and metastasis in NSCLC. The activation of EMT is correlated with poor prognosis for patients accepting either conventional radio-chemotherapies or novel targeted therapies, which indicates the roles of EMT in drug resistance of human cancers [72, 73, 74, 75]. EMT, the most researched mechanism in tumor development, indicates a more aggressive tumor class, higher migration rate and extreme drug-resistance [73, 76]. Instead of an independent biological process, EMT is also responsible for EGFR-TKIs resistance by activating the PI3K/Akt signal pathway . Interestingly, miRNA-221/222 and miRNA-30b-c are upregulated after EMT amplification, which also serve as downstream gene of EGFR . According to analyses on expression of miRNAs between tumor tissues and adjacent normal tissues, there are direct relationships between EMT and oncogenic miRNAs, such as miRNA-221/222 and miRNA-30b-c, indicate for lower drug response, which argues that downregulation of these miRNA genes might be a promising direction for more effective therapies . MiRNAs inhibit tumor developmental processes through multiple mechanisms, which indicate that monoclonal antibody, combined with EGFR-TKIs and chemotherapy become an efficient comprehensive therapeutic strategy for patients with NSCLC . For instance, miRNA-92a triggers EMT by activating PTEN/PI3K/Akt signaling pathway in NSCLC . One novel oncogene, miRNA-181b-5p regulates TGF-β1-induced EMT in NSCLC . Overall, upregulation of these oncogenes is directly involved in proliferation, invasion and drug resistance. Meanwhile, these categories of miRNAs are biomarkers for poor prognosis and lower DFS rate of patients with NSCLC. Alterations of miRNAs expression after radiotherapy, chemotherapy or targeted therapy are correlated with therapy response. According to data from published literatures, miRNAs and multiple treatment plans mutually affect in the clinical processes . In the therapies of NSCLC, miRNAs are observed to have dynamic changes. For instance, after EGFR signal pathway was activated, there was elevated miRNA-21 in NSCLC cell lines . Recent studies show that the expression of miRNA-30b-c/221/222 are downregulated in EGFR-TKIs responsive cell lines, with upregulation of Bcl-2 interacting mediator of cell death (BIM) and apoptotic peptidase activating factor1 (APAF-1) . MiRNA-26a, a tumor suppressor molecule, downregulate in CDDP-resistant sample . Oncogenes, such as miRNA-155, are downregulated in NSCLC cells with gefitinib therapy [52, 53]. These oncogenic miRNAs might upregulate in the resistant cell lines of NSCLC and have the potential to weaken therapeutic efficacy. Conversely, tumor suppressors can also be upregulated in sensitive NSCLC cell lines and adjust therapeutic response. 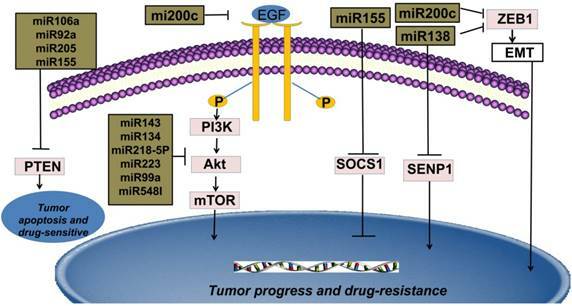 Some miRNAs target EGFR pathway, such as miRNA-143, miRNA-134 and miRNA-218-5p, which are directly related to EGFR-TKIs response in patients with NSCLC [14, 15, 16]. These miRNAs can reverse drug resistance in the clinical therapy process, which might be a novel molecular candidate for targeted therapy in the future. MicroRNAs participate in modulation of therapies-effect such as novel targeted therapy, chemotherapy and radiotherapy. Most NSCLC patients are diagnosed at advanced stage and therefore have an unfavorable clinical prognosis. Due to the side effects of chemotherapy and radiation treatment for NSCLC patients, there is an urgent need on personalized targeted medicine. With high sensitivity and accuracy, dysregulated expression levels of miRNA in vivo may indicate the occurrence of NSCLC earlier than the appearance of symptoms and abnormal CT images . Regulating expression of targeted genes in post-transcription period, miRNAs involve in biological signal channels and thus influence therapeutic effects. This feature indicates that miRNAs will be applied as powerful targets to effective therapy strategy [4, 5]. The most promising example is that NSCLC cell lines with EGFR mutation are more sensitive to EGFR-TKIs than those wild types, and mutation events might relate with expression level of these miRNAs . The EMT promotor, miRNAs, can be detected in vivo, which indicate high heterogeneous property. It is demonstrated that approximately half of miRNAs are located in sensitive regions of chromosomes, with the high possibility of amplification or deletion . These unstable miRNAs play a crucial role in determining effects of therapies and differential expressions of these miRNAs between drug-sensitive and drug-resistance in the NSCLC cell lines have been shown in previous studies. Therefore, the expression level of miRNAs can predict effects and even guide therapies, including radiotherapy, chemotherapy and targeted therapies. More research data show that abnormal expression of miRNAs play important roles in the progression and drug-resistance of NSCLC by modulating oncogenic or tumor-suppressing genes and can act as biomarkers for therapy in NSCLC. These miRNAs with high sensitivity and specificity can serve as biomarkers in targeted therapies especially for advanced patients with NSCLC. Different kinds of miRNAs play different roles by binding to specific targets. These studies revealed that anti-oncogenes miRNAs reverse EGFR-TKIs resistance in the NSCLC by relevant targets (Table 1). Meanwhile, miRNAs are involved in almost every step of the tumor progression (Table 2 and Figure 2). Although published literature indicated a correlation between miRNAs and the therapy of NSCLC, the detailed mechanisms involved have not been clarified, such as the relationship between secondary T790 mutation and miRNAs. Further research is needed to better understand how to overcome drug resistance completely. In summary, miRNAs may serve as powerful biomarkers for diagnosis or prognosis and will be novel targeting therapy in NSCLC. Note: MiRNAs are involved in therapeutic processes by binding to target gene and sensitize drug-response. miRNA: microRNA; IRS-1: insulin receptor substrate-1; EGFR: Epidermal growth factor receptor; IGF1R/PI3K/Akt/mTOR: insulin-like growth factors 1 receptor/phosphoinositide-3 kinase/protein kinase-B/mammalian target of rapamycin; PI3K-SIAH2: Phosphoinositide 3-kinase-seven in absentia homolog2; PKD2: polycystic kidney disease-2; TGFβ2: transforming growth factorβ2; FZD1: frizzled class receptor 1; EIF4G2: eukaryotic initiation factor 4G2; CX3CR1: C-X3-C motif chemokine receptor1; CCNJ: cyclin J; STAT3: Signal transducers and activators of transcription 3; PEBP4: phosphatidylethanolamine-binding protein 4; CDKN1A: cyclin-dependent kinase inhibitor 1A; RAD21: Rad21 homolog (S. pombe); ZEB1: Zinc finger E-box binding homeobox1; EMT: Epithelial-Mesenchymal Transition; SENP1: Sentrin/SUMO-specific protease 1; SOX4: SRY-box4. Note: MiRNAs are involved in therapeutic processes by binding to target gene and hamper drug-response. miRNA: microRNA; PTEN: phosphatase and tensin homology deleted on chromosome ten; SOCS1: Suppressor of Cytokine Signaling 1; Akt: protein kinase-B; HIF 1α: Hypoxia-inducible factor- 1α; BTG2: B-cell translocation gene 2; PRKDC: protein kinase, DNA-activated, catalytic polypeptide; SMAD7: drosophila mothers against decapentaplegic protein7. NSCLC: non-small cell lung cancer; miRNAs: microRNAs; ORFs: open reading frames; pri-miRNA: primary microRNA; pre-miRNA: precursor microRNA; RISC: RNA induced silencing complex; EGFR-TK: epidermal growth factor receptor-tyrosine kinase; PI3K: phosphoinositide-3 kinase; Akt: protein kinase-B; mTOR: mammalian target of rapamycin; RAS: rat sarcoma; ERK: extracellular regulated protein kinases; ZEB1: Zinc finger E-box binding homeobox1; IRS1: insulin receptor substrate-1; IGF1R: insulin-like growth factor 1 receptor; PI3K-SIAH2: phosphoinositide 3-kinase-seven in absentia homolog 2; PKD2: polycystic kidney disease-2; HMGA2: high mobility group A 2; CDDP: cisplatin, cis-diaminedichloroplatinum; TGFβ: tumor growth factor-β; FZD1: frizzled class receptor1; EIF4G2: eukaryotic initiation factor 4G2; PKD2: polycystic kidney disease-2; CX3CR1: C-X3-C motif chemokine receptor1; CCNJ: cyclin J; PEBP4: Phosphatidylethanolamine-binding protein 4; DSBs: DNA double strand breaks; STAT3: signal transducer and activator of transcription 3; PEBP4: Phosphatidylethanolamine-binding protein 4; SENP1: Sentrin/SUMO-specific protease 1; CDKN1A: cyclin-dependent kinase inhibitor 1A; RAD21: Rad21 homolog (S. pombe); PTEN: phosphatase and tensin homology deleted on chromosome ten; SOCS1: suppressor of cytokine signaling 1; HIF 1α: Hypoxia-inducible factor- 1α; BTG2: B-cell translocation gene 2; PRKDC: protein kinase, DNA-activated, catalytic polypeptide; SMAD7: drosophila mothers against decapentaplegic protein7; EMT: Epithelial-Mesenchymal transition; DFS: disease-free survival; BIM: Bcl-2 interacting mediator of cell death; APAF-1: apoptotic peptidase activating factor1. This work was supported by the National Natural Science Foundations of China (No: 81773218; 81472773 and 81703009). Thank Christopher Qoyawayma, who works in the Pediatric division of the Children's Hospital of Pittsburgh of UPMC, University of Pittsburgh, Pittsburgh, Pennsylvania, United States; for his help with the English-language editing of the manuscript.